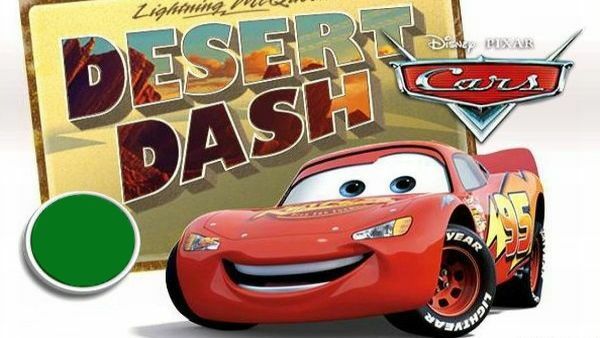 Lightning McQueen (voiced by Owen Wilson, game main character, a hybrid between a Toyota NASCAR with design influences from Mazda Miata and Dodge Viper but painted as Chevrolet Corvette C1) wakes in the middle of traffic and speeds off the highway to find Mack, only to end up in the desert town of Radiator Springs. LIGHTNING MCQUEEN: Oh, boy. Where am I? MATER: Morning, sleeping beauty! 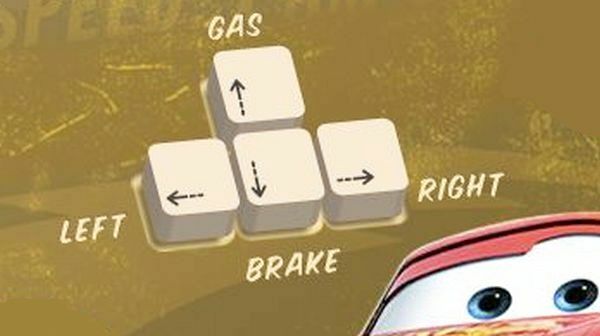 LIGHTNING MCQUEEN: Ah! MATER: Boy, I was wondering when you was gonna wake up. LIGHTNING MCQUEEN: Take whatever you want! Just don't hurt me! A parking boot? What's going on here? Please! MATER (voiced by Larry the Cable Guy, McQueen's best friend and sidekick, a 1951 International Harvester L-170 truck with elements of a mid-1950s Chevrolet): You're funny, I like you already. LIGHTNING MCQUEEN: Just great! MATER: Well, if you think that's great, you should see the rest of the town. LIGHTNING MCQUEEN: You know, I'd love to see the rest of the town! So if you could just open the gate, take this boot off, you and me, we go cruising, check out the local scene. MATER: Dad-gum! LIGHTNING MCQUEEN: How'd that be, Tuhmater? MATER: Cool! SALLY CARRERA (voiced by Bonnie Hunt), Radiator Springs's town attorney, is a 2002 996-series Porsche 911): Don't you think the car responsible should fix our road? LIZZIE (voiced by Katherine Helmond, the widow of Radiator Springs' founder, Stanley, a 1923 Ford Model T): The only guy strong enough to fix that road is Big Al! RAMONE (voiced by Cheech Marin, owns the Ramone's House of Body Art store, a 1959 Chevy Impala Lowrider Chevrolet): Lizzie, Big Al left like, 15 years ago. LIZZIE: Then why are you bringing him up, you lemon? SALLY CARRERA: Oh, he can do it. He's got the horsepower. So, what do you want him to do? ALL: Fix the road!